Here's a round-up of the new content posted on Cupcakes.About.com. If you have an idea for a post for April, please email me or leave a note in the comments. 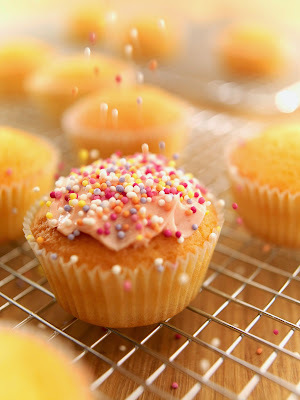 There's always a need for a quick and easy recipe for Yellow Cupcakes. Honey Cupcakes can be a sweet tweet for Passover. Here's some great tips for baking with booze. Prohibition Bakery founders tells Colette Prosper how fun it is to make spirited cupcakes. Haley Southey contributes two cupcake recipes that will make you green with envy. Demetra Overton turns a Girl Scouts cookie into a Do-si-do dance with deliciousness. A variation on the classic red velvet, green velvet cupcakes.